As finfish fisheries increasingly shrink due to overexploitation, management and industry have shifted their attention to the world’s squid fisheries. The emergence of squid fisheries in the global seafood market calls for well-designed and effective management strategies if they are to remain viable. This study assesses the efficacy of squid governance from a social-ecological perspective in three fisheries. This analysis uses an evidence-based approach to characterize the social-ecological system variables that contribute to each fishery management system meeting its stated goals. To do so, I test the hypothesis that the presence of the ten institutional design principles formulated by common pool resource theory leads to more effective squid fishery management. I measure five outcome variables (governance system effect, commons condition trend, basin switch, user group well-being, compliance) to assess governance effectiveness from social and ecological perspectives. This is the first attempt to examine the design principles and operationalize Ostrom’s Social-Ecological System framework to compare globally competitive squid fisheries. Results indicate that each of the three analyzed squid governance systems has met its specified management goals and is associated with positive social and ecological outcomes. Using the Socio-Ecological Systems Meta-Analysis Database (SESMAD), I used secondary data supplemented with semi-structured interviews with key informants to find a strong presence of the design principles in each case. Findings suggest effective squid governance is associated with user-involvement in system operations and contextually appropriate policies, rather than a single overarching squid based strategy. In the face of rising demand for seafood and dwindling fish stocks, resource managers play a critical role in influencing sustainability. Fisheries involve numerous interacting biological, physical, and social factors, but traditional fisheries governance has tended to rely on simplistic models focused on inputs (such as growth rate) and outputs (such as catch rate and mortality). More recent approaches to fisheries management incorporate principles of systems analysis that are better suited to examining complex and dynamic systems such as fisheries that involve both biophysical and social elements. One of the best developed approaches that addresses the many elements of a particular system is Elinor Ostrom’s Social-Ecological Systems (SES) framework, which has been used and built upon by numerous researchers studying common pool resources (Ostrom 2009). Applying this theoretical framework and using the Social-Ecological Systems Meta-Analysis Database (SESMAD), supplemented with semi-structured interviews, I qualitatively analyze and compare three case studies of squid fisheries to assess which SES variables contribute to effective squid fishery governance. I measure governance effectiveness by assessing the extent to which goals stated by each management body have been met since active management began. In general, these goals are a combination of achieving ecological sustainability, economic profit, and social stability. I also measure governance effectiveness by considering other commonly cited social and ecological outcomes of fishery management. The three squid governance regimes examined here are: (1) The Falkland Islands Government (FIG) Fisheries Department’s Falklands Interim Conservation and Management Zone (FICZ) for the Patagonian squid (Loligo gahi); (2) The New Zealand Quota Management System for the Arrow squid (Nototodarus spp. ); (3) The California Department of Fish and Wildlife Market Squid Fishery Management Plan for the California market squid (Loligo opalescens) (Figure 1). These cases were selected because of their direct competition with each other in the global seafood market, their growing importance in this market, and the availability of social and ecological data (Sonu 1993; Vojkovich 1998). Details regarding fishery features such as social, biological, regulatory, and industry information are provided in Appendix 1. Map of case studies locations. (A) World map highlighting in red the three case studies locations with the following markings: (b) Falkland Islands; (c) New Zealand; (d) California. (B) The grey box marks the ‘Loligo Box’ fishing zone off the Falkland Islands. 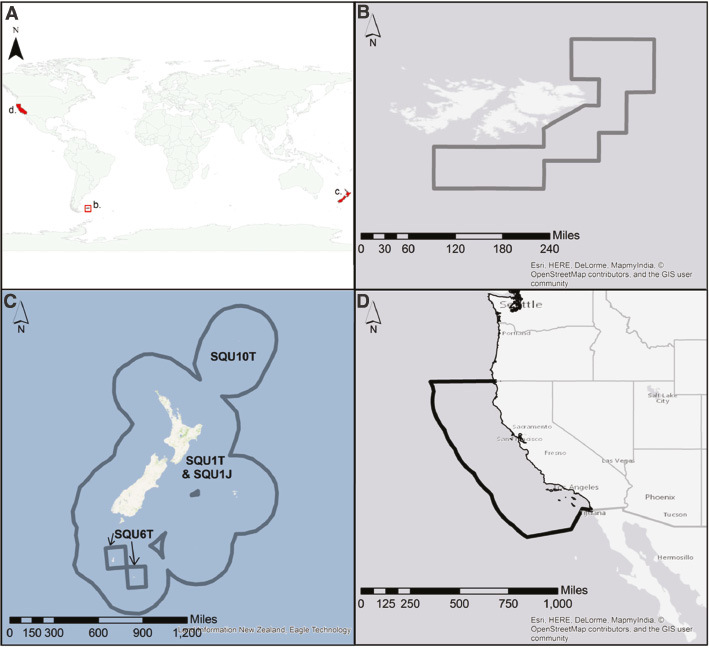 (C) The four arrow squid fishing zones of New Zealand, including the region of concern in this study, the 6T region in the south. (D) The economic exclusive zone (EEZ) of California, marking the zone in which federal management monitors market squid (though most of the fishing occurs within 3 miles of the coast line within this marked region). Squid exist in almost all marine habitats – including the pelagic and shelf areas of all oceans – and contribute to commercial, recreational, and artisanal direct and bycatch fisheries around the world. Of the 290 known species of squid (Order Teuthida), 30–40 squid species support developed commercial fisheries (Arkhipkin et al. 2015). Over the last few decades, squid fisheries have become increasingly significant in the global seafood market (Rodhouse et al. 2014; Arkhipkin et al. 2015). In 1970, global cephalopod catches reached approximately 1 million tonnes, increasing to over 4.3 million tonnes in 2007 (Jereb et al. 2010). Some researchers have proposed that fishing effort is increasingly directed towards cephalopods as finfish stocks are overfished (Boyle and Pierce 1994; Lymer et al. 2010; Rodhouse et al. 2014). The fundamental challenge to squid fishery management relates to the squid’s life cycle. Much of fishery management for other species relies on Maximum Sustainable Yield (MSY), but this approach is not suitable for squid fisheries because of the “gonzo” life strategy of squid that includes fast growth rates, short life spans, poor recruitment of stock relationships, and death after spawning (Mattlin and Colman 1988; O’Dor 1998). These characteristics lead to a weak relationship in stock size from year-to-year which demands a different management approach for squid than for most other fisheries, which are composed of longer-lived species that survive spawning (McGregor and Large 2016). Thus, how squid fishery managers meet social and ecological goals is likely different than in most other fisheries. Squid specific management approaches are particularly necessary considering the large effect climate variability has on squid dynamics (Hoving et al. 2013). Globally, squid fisheries are managed in multiple ways.1 Many smaller squid fisheries remain unregulated (Arkhipkin et al. 2015), as do many squid bycatch fisheries such as Uroteuthis duvauceli in India and Loligo forbesi in Scotland (Rodhouse et al. 2014). There is support among managers that the best form of management for squid is limiting the effort according to environmental conditions and allowing a maximum proportion of the catchable biomass to escape each year, which does not require a formal stock assessment (Caddy 1983; Arkhipkin et al. 2015). However, it is uncertain whether this approach, which requires significant financial and scientific inputs, is feasible for all squid fisheries. Preliminary interviews for this study with industry representatives in Monterey, California in 2014 indicate that many within the squid fishing industry think that squid fishery management is often ineffective and unnecessary. This thought is often on the basis that such fisheries “manage themselves naturally” because the squid are unavailable (outside catchable areas) during strenuous environmental conditions and traditional fishery management approaches require a stock-recruitment relationship, which squid do not have. Across global squid fisheries, only two stocks have collapsed: the northwest Pacific Todarodes pacificus fishery in the 1970s, and the northwest Atlantic Illex illecebrosus fishery in the 1980s (Jereb et al. 2010). While fishing effort likely played a role in these two cases, the primary cause is considered to be unfavorable environmental conditions (Dawe and Warren 1993). In such environmentally sensitive fisheries, highly adaptive governance structures are particularly valuable. While management has been shown to play a significant role in squid fisheries in terms of outcomes such as catch-portfolio flexibility (e.g. Aguilera et al. 2015) and bycatch reduction (Chilvers 2008), further understanding is needed of how management can play a role in the rapid fluctuations of squid fisheries. Fisheries are complex social-ecological systems and thus research studies, particularly those considering management objectives, should include both social and ecological perspectives for effective management. This study examines a variety of squid management outcomes from both perspectives and attempts to identify effective practices that can inform future governance decisions. Ostrom’s SES framework provides a theoretical structure for scholars to identify a multitude of variables that comprise any Common Pool Resource (CPR) system (Ostrom 2007, 2009). The SES framework is useful in that it recognizes the many internal and external components and subsystems that influence a resource system. Studies using the SES framework are able to tap into multiple perspectives such as the role of governing bodies, markets, climate factors, biological and ecological factors, and resource users such as extractors and importers. The operationalization of this framework is exercised through the Social-Ecological System Meta-Analysis Database (SESMAD), a tool that offers an interdisciplinary approach to examine inherently complex resource systems (Cox 2014; SESMAD 2014; Rivero and Hakizimana 2016). SESMAD is the first formal consistent operationalization of SES variables and is a collaborative tool for researchers to describe and compare various CPR systems. Since its conceptualization in 2011, SESMAD has been applied to a variety of systems and research questions regarding resource management issues, ranging from fisheries to forests to the ozone layer (Epstein et al. 2014; Evans et al. 2014; Fleischman et al. 2014; Rivero and Hakizamana 2016; Villamayor-Tomas et al. 2016). This study uses SESMAD’s flexible design to identify and measure influential variables in order to answer four research questions: (1) How do management goals within each squid governance system compare? (2) Has each system met their respective goals? (3) Have these three squid fisheries experienced positive social and ecological outcomes? (4) Does the presence of the institutional design principles contribute to positive social and ecological outcomes? In answering these questions, this study tests one hypothesis: The presence of each of the institutional design principles contributes to positive social and ecological outcomes in squid fishery management. Ostrom identified eight design principals as central to sustaining long-lasting small-scale resource systems (Ostrom 1990). Cox et al. (2010) divided the first two principles each into two separate principles, totaling ten design principles. The ten design principles are: (1A) clearly defined community boundaries, (1B) clearly defined resource boundaries, (2A) appropriation and provision rules conform to local conditions, (2B) congruence between appropriation and provision rules, (3) collective-choice arrangements, (4) monitoring, (5) graduated sanctions, (6) conflict resolution mechanisms, (7) minimal recognition of rights to organize, and (8) nested enterprises (Ostrom 1990; Cox et al. 2010). While these principles have been verified to contribute to effective resource management in many small-scale case studies (e.g. Wittayakpak and Dearden 1999; Quinn et al. 2007), researchers are just beginning to test the validity of the principles as applied to large-scale social-ecological systems (Fleischman et al. 2014; Villamayor-Tomas et al. 2016). This study uses SESMAD to test the validity of this theoretical framework to medium-size CPRs [14,000 km2 (CA)–5,900,000 km2 (NZ)] as one of a number of studies testing the scale at which the design principles remain applicable. I applied methods similar to studies that used SESMAD to test the validity of Ostrom’s design principles in specific CPR cases (Villamayor-Tomas et al. 2016; Ban et al. 2017). I used a meta-analysis approach implemented through SESMAD to systematically determine the social and ecological attributes that may contribute to various outcomes in squid fishery governance (Cox 2014). Variables were coded based on a literature review of sources including peer-reviewed studies, management plans, government publications, industry reports, and NGO publications.2 SESMAD variables are scientifically important concepts that have been assigned a level of measurement and range of possible values, defining an attribute of objects such as actor groups, governance systems, or environmental commons (Cox et al. 2016). Details on those used in this study are in Appendix 2. In accordance with grounded theory methodology described by Glaser and Strauss (1999), sources were collected until no significant new information was found in the literature review. The SESMAD coding system promoted a thorough review by requiring responses to multi-disciplinary questions and variables. For each case in this study I coded one governance system (a system of laws for the Falkland Island and New Zealand cases, and a management plan for the California case), one environmental commons (squid population), and two actor groups (commercial fishers and fishery managers). Based on the literature review, I selected the components that are the most influential on the system. For each case I also coded one interaction in which the relationship among the four components was investigated. The database is designed to produce outcomes within these interactions. Coding was limited to include information during a time period in which the fishery was actively managed. Table 1 summarizes the components coded for each case. Figure 2 shows the coding structure of one case, the California market squid case, to depict the different coded sections. SESMAD coding diagram for each case. Each colored box indicates a separately coded component. In the governance interaction, each colored box is coded again, but in relation to the other components. Red lines represent the linkages among the four coded components indicating that within the governance interaction, each component takes the others into consideration. To fill in missing data gaps after initial coding – which ranged from about 10% of the variables for California to 27% for Falkland Islands to 35% for New Zealand – I conducted semi-structured interviews with key informants for each case. Informants were selected based on their involvement in the governance, industry, or scientific monitoring programs within each fishery. Interviews were conducted over the phone, computer conferencing, or email. Fourteen interviews averaging an hour long occurred from November 2016 to January 2017 with three participants involved with the Falkland Islands fishery, eight persons related to the New Zealand fishery, and three participants from the California fishery. Due to the low sample size of this study (n=3), and following the traditional case study method, I used qualitative analyses. Of the possible outcomes that were coded within SESMAD, I focused on and measured those that would contribute to better understanding governance efficacy. I then identified and measured 21 coded variables that contribute to each of Ostrom’s design principles. To test this study’s hypothesis, I compared the design principle variables in relation to the identified outcomes. I applied a pattern-matching technique which compares empirically based patterns from the study’s findings with predicted patterns defined prior to data collection, in this case Ostrom’s SES design principle theory (Trochim 1989; Yin 2013). I compared case study findings from the literature review and interviews with the SESMAD variables expected to indicate the presence or strength of the design principles in a resource system. In order to consider the potentially significant role of variables in SESMAD other than the design principles, I coded all independent variables in SESMAD and selected those that were highly relevant to outcomes in one or more case. SESMAD’s structure helped guide this process as variables are linked with related themes and theories; e.g. the “environmental monitoring” variable is linked under the “enforcement” theme, the “CBNRM (community-based natural resource management) design principles” theory, and the “conditions for general resilience” theory. Additional variables not pertaining to a design principle but that especially contribute to a case’s social and ecological outcomes, particularly in terms of the governance system meeting its goal, are detailed in Appendix 3. I measured the variables by following the specific coding structure for each variable that is provided by SESMAD; the coding options for each variable are described in the tables in the Appendix. The literature review and SESMAD coding process provided the necessary data to address the first research question, how the management goals within each squid governance system compare. These goals are described in each case subsection (A, B, C) below. To respond to the second research question, this study tested the governance system effect variable, indicating whether the goals of the squid governance system have been met. To address the third research question (have positive social and ecological outcomes been experienced), I identified four outcomes from social and ecological perspectives: (1) Commons Condition (Squid Population) Trend; (2) Basin Switch (has the squid population switched stable states? ); (3) Fisher Well-being Change; and (4) (Fisher) Compliance. Table 2 summarizes the coding results of each outcome in each case. Definitions and details on how each social-ecological outcome is coded within SESMAD are included in Appendix 2 (Table A.2.1). Green indicates outcome increased/improved during analyzed time period, yellow indicates consistent/ no-change outcome, and red (which is absent) would indicate outcome decreasing/weakening. The governance system effect variable is an ordinal variable with three options: (1) Failed to meet goals, (2) Mixed effects on goals, (3) Met goals in response to the question: “To what extent has this governance system achieved its goals in relation to the environmental commons?” All three cases were coded as (3) Met goals. Below, I identify the squid management goals for each case and discuss the rationale behind why each case was considered to have met its goals. The establishment of the Falklands Interim Conservation and Management Zone (FICZ) introduced three management objectives that apply to the squid fishery: (1) To conserve the resource, and thus ensure its continued productivity; (2) To maintain the economic viability of the fisheries as a whole; (3) To enable the Falklands to enjoy greater benefits from the resource (Anonymous 1989). When the Individual Transferable Quota (ITQ) system was implemented in 2005, a range of additional goals were added to these greater goals, including increased or improved diversification, economic performance, enforcement, international competitiveness, government income, and environmental stewardship (Harte and Barton 2007). While this study considers these three original goals and the additional ITQ goals, it primarily focuses on the primary goal of squid management, which is to stabilize the fishery. Thus far, the Falkland Islands squid fishery management has met this goal of stability, as the squid population is still productive, the fishery has remained at an economically profitable level, and the greater community is profiting from the industry’s contribution to the GDP (Roper et al. 1984; Arkhipkin et al. 2013; Winter 2016). While the second fishing season has been closed early a number of times, doing so has kept the squid population at a considered healthy status and has not created major economic consequences (Arkhipkin et al. 2013). The same fishing companies have remained in the fishery and many are beginning to invest in constructing new vessels due to their confidence in the stability of the fishery. The de jure goals of New Zealand’s management of the squid fishery are two-fold. The first set of goals was determined through the Quota Management System (QMS) implementation, with a reevaluation of goals outlined in the Fisheries Act of 1996. As described by the Fisheries Act of 1983, the goals of the QMS are: “to conserve, enhance, protect, allocate, and manage the fishery resources within New Zealand fisheries waters having regard to the need for – (a) Planning, managing, controlling, and implementing such measures as may be necessary to achieve those purposes: (b) Promoting and developing commercial and recreational fishing: (c) Providing for optimum yields from any fishery and maintaining the quality of the yield without detrimentally affecting the fishery habitat and environment.” The 1996 Fisheries Act restructured the goals to have a more sustainable ecosystem-based approach, designating that the goals for management are: “to provide for the utilisation of fisheries resources while ensuring sustainability. [Sustainability referring to]: (a) maintaining the potential of fisheries resources to meet the reasonably foreseeable needs of future generations; and (b) avoiding, remedying, or mitigating any adverse effects of fishing on the aquatic environment. [And utilisation meaning] conserving, using, enhancing, and developing fisheries resources to enable people to provide for their social, economic, and cultural well-being” (Section 8:a). In the realization of these goals, squid management focuses on two aims: (1) to maintain a stable fishery through a Total Allowable Commercial Catch (TACC) in order to “maintain the stock at or above a level that can produce the maximum sustainable yield” (Fisheries Act 1996, Section 13.2), and (2) to minimize bycatch mortality (primarily sea lion mortality) from fishery interactions (Fisheries Act 1996, Section 15.1). While squid fishery management does monitor the TACC and has kept it at a stable level for multiple years, the primary goal and focus of management is to minimize mortality rates of the New Zealand sea lion (Phocarctos hookeri) from fishery interactions. There has been a clear reduction in New Zealand sea lion bycatch mortality within the squid fishery (Hamilton and Baker 2016; Thompson et al. 2016). Observed capture rate (sea lions per 100 trawls) and estimated sea lion captures have decreased during this study’s time period (Ministry of Primary Industries 2016a,b). The number of interactions has decreased, likely due to a combination of a declining sea lion population and efforts to minimize interactions (e.g. 12 nautical mile zone, spotter ships). Sea Lion Exclusion Device (SLED) efficacy has increased, decreasing mortality rate (Ministry of Primary Industries 2016a). In the mid 1990s, the squid fishery captured ~130 sea lions, substantially lower than the ~10 sea lions captured per season in the late 2000s (Ministry of Primary Industries 2012b, 2016a). While consistent data on mortality rates pre-1980 are unavailable, study participants noted that that ~1 sea lion was killed per week in the early 1980s from the squid fishery, whereas reports indicate in the 2010s, ~1 sea lion was killed per year (Ministry of Primary Industries 2016a). The Market Squid Fishery Management Plan’s (MSFMP) goals are “to manage the market squid resource to ensure long term resource conservation and sustainability, reduce the potential for overfishing, and institute a framework for management that will be responsive to environmental and socioeconomic changes” (State of California Resources Agency 2005). The primary goal of market squid fishery management is to maintain a sustainable squid population (via seasonal catch limitation) for both social and ecological considerations. In the time since the management plan was established, landings have continued with no fishery crashes to date. For all but two seasons (2010–11, 2011–12) when water temperatures were unusually warm, and thus squid were naturally more accessible, the fishery has remained under the seasonal catch limit of 118,000 short tons (California Department of Fish and Wildlife 2016). While the catch limit represents historical high landings rather than a calculated ecological threshold, management has determined that squid population will remain healthy, as will the ecosystem dependent on it, if the catch remains under 118,000 short tons, and no evidence to contradict this assumption has been observed (Dorval et al. 2013). The goals of the three squid governance systems are similar in that they all aim for long-lasting fisheries that conserve natural resources while contributing to a robust economy. All three governance systems emphasize social and ecological goals. However, the primary goals of each system are very different. The Falkland Islands case aims for social stability, the New Zealand case aims for sea lion conservation, and the California case aims to maintain a sustainable squid population. While the New Zealand sea lion population is listed as ‘Endangered’ by the IUCN and is in decline, this study focuses on SLED efficacy and capture rate to determine if the Ministry of Primary Industries (MPI) management goal of reducing fishing related mortality has been met. This study does not attempt to determine if the sea lion population has recovered because of fishing management, only that is has not been further harmed. This study shows that each governance system has met its primary goals in the time since management first became effective until present (2016). Of the other outcomes measured in this study, two are ecological [commons condition (squid population) trend, basin switch (has the squid population switched stables states)] and two are social (fisher well-being, fisher compliance). Of these, all three cases have resulted in positive outcomes (positive referring to a trend towards healthy squid populations in a desirable state, fishers’ general well-being improved, and the observance of governance rules). The only exceptions to the positive results are the commons conditions in each case and well-being for California fishers. These four instances have stayed the same during the analyzed time period. However, this is not considered a negative outcome, since all were in a generally positive state before the coded management regime. Thus, I conclude that the governance systems of all three squid fisheries are effective (met goals) and are associated with positive social and ecological outcomes. To assess the role of the design principles in each case and address the fourth and final research question, I coded between one and five variables within SESMAD for each principle. Coding results for each of the variables that contribute to each principle are shown in Table 3. Details on the coding structure and definitions of each of these variables are provided in the Appendix 2 (Table A.2.2). These selected variables examine multiple perspectives in order to thoroughly reflect the design principles. For example, five perspectives are identified to investigate monitoring from multiple angles. Based on how a variable was coded and the level of uncertainty of the results, I determined that all design principles are met, with three to six of the ten principles somewhat met in each case. Coding results of variables contributing to presence of design principles. Colors indicate a variable’s association with CPR theory, green indicates the value is more likely to contribute to resource sustainability, yellow to be somewhat met, and red indicates it is least likely to contribute to resource sustainability, according to CPR theory. Of the coded numbers, (3) indicates that component to its specific principle is met, (2) indicates principle component somewhat met, and (1) indicates principle component absent. To assess how governance has contributed to these positive outcomes, this study analyzes the presence and role of each of Ostrom’s CPR theory-based design principles in each case. The following section reviews these principles for each case. The principles’ apparent roles in each case along with the positive coded outcomes support the hypothesis that the presence of the ten institutional design principles contributes to positive social and ecological outcomes in squid fishery management. The first design principle can be considered two separate principles, one referring to a clear definition of resource user individuals and groups, and the other to a clear definition of the resource system’s physical boundaries (Ostrom 1990; Cox et al. 2010). This specification is a critical first step to applying outsider exclusion and other rules. Setting boundaries is also key to internalizing the positive and negative externalities of resource use, thus ensuring that users share consequences (Cox et al. 2010). Well-defined boundaries provide the necessary scope for both applying rules and assessing outcomes. In the cases examined in this study, the full spatial distribution of the resource is largely unknown (principle 1B), but each of the governance systems have met their goals with the contribution of clear user boundaries (principle 1A). The physical boundaries of squid populations are uncertain in most global squid fisheries. Squid boundaries are often determined by depth and water mass, but vary according to environmental conditions. While these fisheries are among the most heavily studied, their exact distributions remain unknown. Of the three species, the distribution of arrow squid is the least certain. Despite this uncertainty, each management system is very clear on who can fish where (principle 1A). While the California system is most negotiable for new actors, new players are rare in all three systems. This is mostly a reflection of the high cost of entry in each fishery and the availability of quota and/or permits. The migration behavior of California market squid contributes to the goal of maintaining a sustainable squid population in that squid are often found nearshore, but migrate to areas that are not accessible by fishing vessels during periods of ecosystem stress, such as El Niño events. The clearly designated areas of the Loligo Box in the Falkland Islands and the 6T region of New Zealand simplify government enforcement and resources to focus on one area and minimize risk in the uncertainty of population distribution by consolidating effort in one area so that the population may thrive elsewhere. In terms of the Loligo Box, the area assists self-monitoring activity as vessels are aware that only licensed squid vessels may fish in the area. Likely, the presence of this principle contributes to positive fisher well-being outcomes in the cases, as clear boundaries lead to more certainty and less risk, and in the case of New Zealand and Falkland Islands, standard working conditions. As in the first principle, the second original design principle has been divided. The first part of this principle (2A) is that both appropriation and provision rules should conform to local conditions (Cox et al. 2010). Appropriation rules include guidelines that relate to time, place, technology, and quantity of resource units. Provision rules relate to labor, materials, and finances (Ostrom 1990). Rules that reflect the local context must also appropriately fit within the set of rules that apply to the whole system if to best contribute to the long-term survival of the CPR system. The second principle in this section (2B) is that resource systems are more likely to lead to successful outcomes if the costs users incur (e.g. labor, material, money inputs as determined by the provision rules) align with benefits of adhering to the appropriation rules (Cox et al. 2010). The variable social-ecological fit (SE fit) measures how governance reflects the local context, measuring the first design principle in this section. The Falkland Islands case has high SE fit, with squid most abundant in the Loligo box and key life stages such as spawning safeguarded through protected areas closed to fishing. The Loligo box has successfully removed finfish trawlers from the area and confined squid vessels to the area (Hatfield and DesClers 1998). The Falkland Islands Government has jurisdiction over this entire area, and containing fishing activity to an area comprising mainly one habitat has resulted in more effective and less costly enforcement. The New Zealand squid governance focuses management activity in the SQU6T region, since most of the landings and most of the sea lion interactions occur in that area. While the SQU6T fishery has a high SE fit, the other three squid arrow fisheries in New Zealand are considered low SE Fit. The SQU10T “fishery” has no fishing activity due to marine protected areas and low squid availability in the area. The SQU1T region incorporates multiple habitats and reflects geopolitical boundaries (EEZ): since the range and preferred habitats of arrow squid are uncertain, the social (EEZ) and ecological (squid distribution) systems in this area are misaligned. The California case has a medium SE fit because, while the squid are predominately found in California waters, their distribution extends to two other states and two other nations (Mexico and Canada). Thus, not all users of the squid population fall under state jurisdiction. The primary mechanisms for satisfying SE fit in all cases are well-placed active fishing areas and scientifically-based protected areas which prohibit fishing in squid key life stage areas. Management in all cases focuses on where squid population is most abundant. The relatively high social-ecological fit shows that each governance system has attempted to consider local contextual situations in fishery management. For the second part of this section (principle 2B), all three fisheries exact high costs from fishers, particularly for the factory trawlers in the Falkland Islands and New Zealand. However, fishers also benefit in all three cases from participation in collective action. While each fishery produces high revenue, each governing entity continues to allocate quota/catch limits, retain the same users from year to year, and maintain a squid population with no evidence of overfishing. The collective-choice arrangement design principle pertains to the involvement of users in the modification of operational rules if they are affected by such rules. This principle is similar to the previous in that it emphasizes localized application. While it often does, Ostrom clarifies that such participant involvement does not necessarily lead to compliance, commitment, or effective rules. Rather, such a system decreases the likelihood that rules will need to be changed, which would result in avoidable costs and would interrupt any continuous long-term monitoring or assessment of system progress. Fishers in all three cases are consulted regarding management decisions, with the government management body as the ultimate decision-maker. Formal processes encourage fishers to engage, debate, and share knowledge with fishery managers. In every case, a fishing industry association represents fishing industry interests: Falkland Islands Fishing Companies Association in the Falkland Islands, Deepwater Group (DWG) in New Zealand, and the California Wetfish Producers Association in California. Participants within each of the three squid fisheries generally know the other participants in their system well, and social pressure to adhere to the rules is evident in each case (this also contributes to social monitoring in the following principle). Collective action in the New Zealand and California cases has largely been a response to the potential of government management bodies closing the fishery down. Through collective action, the industry presents a united front, and acknowledges the likelihood of the governance system limiting future fishing effort due to one or a few deviants. In the Falkland Islands, collective action is a factor of the small community, and the fishing association was formed through law via the Fisheries (Conservation and Management) Ordinance 2005. A strong social stigma against violations and a strong sense of community encourage collective action mechanisms in all three cases. However, the strongest form is observed with the role of the New Zealand DWG, which represents squid quota holders and makes industry-level changes in practice standards and informal requirements. DWG decides on rules and enforces them, even if there is no legal aspect to these industry created rules. Participants acknowledge that the role of the DWG contribute the most to management goals. The DWG formed such rules without management recommendation in order to get ahead of any movement toward fishery closure, which would be a reaction to sea lion interactions. SLEDs are not mandatory by MPI, but DWG leaders ensure that every squid vessel uses one and that each vessel signs a Code of Conduct. These informal regulations are adhered to by the fishing industry primarily as a result of social pressure. Collective action benefits are also observed in vessel maneuvering, where vessels remain in the 1T region and send a scouter vessel to occasionally check if the squid population has returned to the 6T region. This arrangement minimizes the risk of sea lion-fishery interaction by minimizing the number of vessels in the 6T region until necessary. This allows more fishing time before the fishery is closed due to the fishing mortality rate limit that season, and contributes to management achieving its goal of minimizing sea lion mortality incidents. In California, a fisher-led proposal to close the fishery during the weekends to allow for community relief (fishers to spend time with families during the weekends without feeling the need to compete on the water) was adopted by management, as uninterrupted spawning led to ecological benefits. In terms of other outcomes, the inclusion of the fishing community in the rule making was considered by study participants, particularly in the Falkland Islands case, to contribute to more preventative approaches to management, which is thought to contribute to positive basin switch and commons condition trend outcomes. The monitoring design principle applies to the assessment of the CPR conditions or CPR users. According to Ostrom, monitors should be held accountable to the resource users, or should be the resource users themselves for maximum effectiveness (Ostrom 1990). Both the presence and accountability of monitors must be ongoing to achieve best CPR management results, though not every case presents both (Cox 2014). All three fisheries monitor fishing activity and track the squid population, though the New Zealand fishery employs no direct monitoring of the squid population and relies on industry reports. All three fisheries have external monitoring by a government management body. In all three cases, fishers self-monitor the fishery in that vessels report violations they observe. Landings are carefully tracked in each fishery. While the fishing industry associations in all three cases participate in fishery monitoring to some extent, the New Zealand Deepwater Group plays the largest role. The DWG established its own standardized monitoring program related to sea lion and sea bird interaction. SLED use is tracked by DWG rather than by MPI. The real-time monitoring in the Falkland Islands depends heavily on industry participation. Onboard observers play a crucial role in monitoring both in the Falkland Islands and in New Zealand, and in both cases observers report back to the government frequently. The Falkland Islands observers focus primarily on catch and characteristics of the catch (e.g. location, size of species) and the New Zealand observers focus primarily on SLED use and bycatch interaction. Government monitoring in both of these cases includes high technology such as aircraft and patrol boats. California experiences more monitoring from land than the other two fisheries, since fishing activity in California tends to be coastal and dockside monitoring has recently been implemented. Designated scientists within the management team are responsible for surveying and monitoring the squid population. While industry contributes some funding for monitoring in California, the state and federal governments fund squid monitoring. By comparison, industry primarily funds monitoring in the Falkland Islands and New Zealand. The strong social pressure in each community has contributed to the positive outcome of compliance in all three cases. The first four design principles converge to make the fifth principle more achievable. The first three create rules and the fourth assesses system condition and compliance. When the operationalized rules are broken, the graduated sanctions principle suggests that penalties must exist to hold resource users accountable for violations. Such sanctions should appropriately reflect the gravity and frequency of the infraction. Sanctioning deters excessive violations, and helps maintain community cohesion (Cox et al. 2010). Ostrom notes that the enforcers can be officials and/or other resource appropriators (Ostrom 1990). All three fisheries have external sanctions given by the fishery management body, and sanctions reflect the gravity and frequency of violations. Top forms of sanctions in all three cases include fines, loss of privileges, imprisonment and/or confiscation. Vessels in each case report misconduct, though in California and especially in New Zealand, misconduct is often internalized. In all three cases, fishers do not impose sanctions. However, informal internal social pressure exists in all three. The Deepwater Group offers the most official form of informal sanctions, in that the industry group requires all squid vessels to sign a Code of Conduct before each season. Since most of the key rules in the New Zealand case, such as SLED use, are not required legally, social pressure plays a larger role than formal sanctions. Similarly, participants in the Falkland Islands note that sanctions are not imposed lightly, as they result in consequential social stigma. Such stigma is likely a product of a small, isolated population that heavily depends on the resource, and is thus wary of population collapse. Rules in true CPR systems are never completely unambiguous or enforced by external, all-knowing officials (Ostrom 1990). Rules cannot be, because they often do not fully describe every scenario, possible interpretation, or violation for every case. Often, these missing details can result in loopholes where rules can be broken purposefully or unintentionally. Therefore, systems need a forum for discussing rules and violations and for clarifying rule information. Such a mechanism is crucial for system longevity, even though Ostrom notes that it does not necessarily guarantee it. Formal conflict resolution mechanisms are present in each of the three cases. In the Falkland Islands, companies can petition if they feel unjustly dealt with. However, these formal processes are rarely used. In the New Zealand case, fishers are able to take advantage of defended and non-defended hearing options (Ministry of Primary Industries 2012a). Any disagreements can go to court, as has been particularly relevant in the early 2000s when the fishing industry took the Minister to high court which overturned a fishery closure (Ministry of Primary Industries 2016b). The CWPA engages in conflicts to protect fishers and processors, and can bring issues to state court. Official stakeholder engagement processes such as public hearings allow conflicts to be discussed in a formal procedure. Having a pathway for conflicts to reach an official court when necessary, even while many cases can be resolved more informally through constant dialogue, contributes to continuous evaluation and discussion that adds to positive outcomes in all three cases. While formal governmental jurisdictions may have a critical role in creating and enforcing rules, this design principle stresses the importance of user-dictated rules. In this principle, it is equally vital to CPR longevity that external government authorities recognize and respect the rules that users may devise (Ostrom 1990). In the Falkland Islands and New Zealand, fisheries are managed at a large scale and rules are made at the national level. However, users do influence rules and users are recognized as critical to rule-making. As a dependency, the United Kingdom recognizes the Falkland Islands government and their right to manage their own fisheries. While management may be at the national level, the Falkland Islands population is small (2840 people in 2012) and most residents know each other, so this case can be considered community-based management where users have substantial influence in rule making (Falkland Islands Government 2012). In New Zealand, most of the decision-making is at the national level, but management does take community requests into consideration and looks to DWG to implement their own standards. MPI recognizes DWG’s leadership in implementing their own rules, which are often stricter than the formal rules. The Minister makes ultimate decisions regarding the fishery, but the court can overturn any decision to recognize other interests. External recognition is high in the California case because, while federal policies take precedence and the Pacific Council includes market squid as a monitored species, California Fish and Wildlife is recognized as the primary management body. ‘Nested enterprises’ refers to the multiple levels, or multiple scales, that influence or manage the CPR. Such levels include appropriation, provision, monitoring, enforcement, and conflict resolution (Ostrom 1990). For each of these activities, local, regional, national, and sometimes international levels all play significant roles, and often focus on very different goals, problems, and constraints. This principle suggests that each level involved needs to have established rules regarding that CPR. Management for each fishery is influenced by multiple levels, most of which coordinate amongst each other. The national level management of the Falkland Islands and New Zealand fisheries allows international and national issues to be directly dealt with. Falkland Island’s relationship with the United Kingdom allows for defense-support should their claim to highly lucrative fisheries such as squid be threatened. California can rely on federal policies or federal agencies should interstate or international issues arise. All fishery systems allow for the communication of concerns, and consider input from representatives from multiple levels, including fishing community concerns, national interests concerns, and international conservation concerns. In New Zealand, financial limitations from the government make it difficult to provide resources for every level (e.g. jigging monitoring, squid assessments). However, the system is open to outside players such as contractors and NGOs contributing to the system, especially in relation to international concerns regarding the New Zealand sea lion population. While coding identified many factors that influence outcomes in these fisheries, results are not considered deterministic (e.g. show no cause and effect, only relationships). Although results show that each governance system has met its respective goals, this study acknowledges that there is no guarantee that such success will continue. Additionally, identifying goals as having been met is not an indication that such goals are completely satisfied to the full extent possible. For example, while sea lion mortalities have decreased in the New Zealand case, there is room for further progress in decreasing that rate even more. This study contributes three medium-sized common pool resource system cases to SESMAD to help build the database for future collaborative research projects. The novelty of SESMAD encourages creative applications for the tool, particularly in exploring new ways to conduct social-ecological case studies. This study gained from the diagnostic format of coding each SES variable, as it required multiple perspectives and multi-disciplinary data that may have been unintentionally excluded had the database not identified them. A tool such as SESMAD allows for the comprehensive and interdisciplinary analysis required for investigating complex environmental resource issues. Interdisciplinary teams are often best suited for studying social-ecological systems, as many factors from many areas of study are relevant. However, SESMAD provides the operational structure for a single researcher to conduct such studies, as I was able to tap into the knowledge of the many scholars from multiple fields who contributed variables, theories, and examples to SESMAD. As a database user, I was able to expand beyond my individual knowledge to better grasp potentially important factors when assessing these complex fisheries. While not utilized in this study, the ability to compare snapshots in time has the potential to contribute significantly to the study of system transformations, as all resource systems will experience substantial transformations (Nelson et al. 2007). The database is particularly helpful in assessing data poor fisheries, such as many squid fisheries, as they benefit from full system studies that can integrate information from multiple perspectives and sources of knowledge and thus can contribute to a more complete knowledge of the dynamics in the fishery. This study compares three commercial squid fisheries that compete in the global market, and finds that while the de jure goals are similar in each governance system and aim for both social and ecological benefits, the primary goals management focuses on are very different. These goals reflect the particular social-ecological context of each case. From the implementation of each governance system until present, results indicate that each governance system has met its specific goals. The positive social and ecological outcomes tested in this study other than management specified goals suggest that the fishery management primary goals likely appropriately reflect the broader goals of the governance system, in that no one outcome is obviously prioritized over another. Study findings support the hypothesis that design principles remain valid in larger common pool resource systems. The design principles are associated with squid governance meeting both social and ecological goals. Results converge with CPR theory and also demonstrate that CPR theory (design principles and other SES factors) is useful in comparing system outcomes in dynamic, globally influenced fisheries. These fisheries are complex with multiple levels, and their effective governance is largely a factor of user-involvement in system operations. As squid fisheries become increasingly significant to the global seafood market, creative and effective management strategies specific to squid’s particular dynamics will also become increasingly necessary. While a variety of management options are discussed in the literature, here I present three cases each with a different approach but all with successful outcomes: the Falkland Islands case is a quota system based on Total Allowable Effort and a spawning stock minimum, the New Zealand case is a quota system based on Total Allowable Catch and Fishing Mortality Rate Limit, and the California case is a limited entry fishery based on a seasonal catch limitation. This study suggests that squid management is likely to be effective with any approach that takes into consideration the design principles and is open to other SES factors relevant to each case. Study results highlight the need for local context-based policies and practices in squid fishery systems. While the design principles are present in each governance system, each case’s particular situation is illuminated by one specific variable. The Falkland Islands case is shaped primarily by minimal recognition of rights to organize, the New Zealand case is largely shaped by collective action mechanisms, and the California case is mostly shaped by multiple levels. While these fisheries do experience climate variability, climate change will undoubtedly present new stresses to each system. In particular, population migration in response to temperature changes will present spatial and technological challenges to the industry and management. In accordance with CPR theory, I speculate the strong presence of the design principles will position these systems to better adapt to and mitigate climate change consequences. 1Current squid management strategies employ a wide assortment of control tools such as limited access (Dosidicus gigas in Peru), trip limits (Doryteuthis pealeii in the USA), minimum landing size (Loligo vulgaris in Portugal), limit on number of crew (Loligo reynaudi in South Africa), restricted fishing areas (Berryteuthis magister in Russia), seasonal closures (Loligo gahi in the Falkland Islands), limiting use for human consumption (Dosidicus gigas in Chile), spawning escapement retainment (Dosidicus gigas in Mexico), total allowable effort (TAE) (Nototodarus gouldi in Australia), total allowable catch (TAC) (Nototodarus sloanii in New Zealand), temporal restrictions other than seasons (Loligo opalescens in USA), and technological requirements such as light intensity restrictions (Todarodes pacificus in Japan) and minimum net mesh sizes (Loligo opalescens in the USA) (Rodhouse et al. 2014; Arkhipkin et al. 2015). Many of these strategies are used in conjunction with one another. Squid fisheries also differ widely in the attention and effort allocated to their management. 2As the coder of these three cases, I participated in two workshops dedicated to inter-coder reliability, to ensure variables are interpreted correctly, to ensure consistency among the three cases of the study, and to establish consistency of this study with other SESMAD studies. In addition, SESMAD includes an online coding resource with definitions of variables and possible value options to standardize coding results among cases. I thank first and foremost this study’s participants from California, the Falkland Islands, and New Zealand; I gratefully acknowledge the time and willingness of all interview participants. Thank you to the University of Miami Abess Center for Ecosystem Science and Policy for providing the financial support to conduct this research. Thank you to the SESMAD developers, and thank you to the SESMAD Oceans Team, Natalie Ban, Tammy Davies, Cassandra Brooks, Michael Cox, Graham Epstein, Louisa Evans, Sara Maxwell, and Mateja Nenadovic, for their training in SESMAD methodologies and guidance of common pool resource theories. Special thank you to Natalie Ban for her financial support in traveling to and attending SESMAD workshops. Thank you to Kenny Broad, Gina Maranto, and Andrew Carter for constructive comments. Aguilera, S. E, Cole, J, Finkbeiner, E. M, Le Cornu, E, Ban, N. C, Carr, M. H, Cinner, J. E, Crowder, L. B, Gelcich, S, Hicks, C. C, Kittinger, J. N, Martone, R., Malone, D., Pomeroy, C., Starr, R. M., Seram, S., Zuercher, R. and Broad, K. (2015). Managing Small-Scale Commercial Fisheries for Adaptive Capacity: Insights from Dynamic Social-Ecological Drivers of Change in Monterey Bay. PLoS One 10(3): e0118992. https://doi.org/10.1371/journal.pone.0118992. Anonymous. Falkland Islands Interim Conservation and Management Zone Fisheries. Report ’87/88, 45. Stanley: Falkland Islands Government. Arkhipkin, A, Barton, J, Wallace, S and Winter, A (2013). Close Cooperation Between Science, Management and Industry Benefits Sustainable Exploitation of the Falkland Islands Squid Fisheries. Journal of Fish Biology 83(4): 905–920. http://dx.doi.org/10.1111/jfb.12098. Arkhipkin, A. I, Rodhouse, P. G. K, Pierce, G. J, Sauer, W, Sakai, M, Allcock, L, Arguelles, J, Bower, J. R, Castillo, G, Ceriola, L, Chen, C. S, Chen, X., Diaz-Santana, M., Downey, N., González, A. F., Amores, J. G., Green, C. P., Guerra, A., Hendrickson, L. C., Ibáñez, C., Ito, K., Jereb, P., Kato, Y., Katugin, O. N., Kawano, M., Kidokoro, H., Kulik, V. V., Laptikhovsky, V. V., Lipinski, M. R., Liu, B., Mariátegui, L., Marin, W., Medina, A., Miki, K., Miyahara, K., Moltschaniwskyj, N., Moustahfid, H., Nabhitabhata, J., Nanjo, N., Nigmatullin, C. M., Ohtani, T., Pecl, G., Perez, J. A. A., Piatkowski, U., Saikliang, P., Salinas-Zavala, C. A., Steer, M., Tian, Y., Ueta, Y., Vijai, D., Wakabayashi, T., Yamaguchi, T., Yamashiro, C., Yamashita, N. and Zeidberg, L. D. (2015). World Squid Fisheries. Reviews in Fisheries Science & Aquaculture 23: 92–252. http://dx.doi.org/10.1080/23308249.2015.1026226. Ban, N. C, Davies, T. E, Aguilera, S. E, Brooks, C, Cox, M, Epstein, G, Evans, L. S, Maxwell, S. M and Nenadovic, M (2017). Social and Ecological Effectiveness of Large Scale Marine Protected Areas. Global Environmental Change 43: 82–91. http://dx.doi.org/10.1016/j.gloenvcha.2017.01.003. Boyle, P. R and Pierce, G. J (1994). Fishery Biology of Northeast Atlantic Squid: An Overview. Fisheries Research 21(1–2): 1–15. https://doi.org/10.1016/0165-7836(94)90093-0. Caddy, J. F (1983). The Cephalopods: Factors Relevant to Their Population Dynamics and to the Assessment and Management of Stocks. Advances in Assessment of World Cephalopod Resources. : 416–457. Rome: FAO Fisheries Technical Paper. California Department of Fish and Wildlife. California Commercial Market Squid Landing Receipt Data, https://www.wildlife.ca.gov/Conservation/Marine/CPS-HMS/Market-Squid/Market-Squid-Landing. Chilvers, B. L (2008). New Zealand Sea Lions Phocarctos Hookeri and Squid Trawl Fisheries: Bycatch Problems and Management Options. Endangered Species Research 5: 193–204. https://doi.org/10.3354/esr00086. Cox, M (2014). Understanding Large Social-Ecological Systems: Introducing the SESMAD Project. International Journal of the Commons 8(2): 265–276. http://doi.org/10.18352/ijc.406. Cox, M, Arnold, G and Villamayor-Tomás, S (2010). A Review of Design Principles for Community-Based Natural Resource Management. Ecology and Society 15(4): 38. http://www.ecologyandsociety.org/vol15/iss4/art38/. Cox, M, Villamayor-Tomas, S, Epstein, G, Evans, L, Ban, N. C, Fleischman, F, Nenadovic, M and Garcia-Lopez, G (2016). Synthesizing Theories of Natural Resource Management and Governance. Global Environmental Change 39: 45–56. http://dx.doi.org/10.1016/j.gloenvcha.2016.04.011. Dawe, E. G and Warren, W. G (1993). Recruitment of Short-Finned Squid in the Northwest Atlantic Ocean and Some Environmental Relationships. Journal of Cephalopod Biology 2(2): 1–21. Dorval, E, Crone, P. R and McDaniel, J. D (2013). Variability of Egg Escapement, Fishing Mortality and Spawning Population in the Market Squid Fishery in the California Current Ecosystem. Marine and Freshwater Research 64: 80–90. http://dx.doi.org/10.1071/MF12085. Epstein, G, Nenadovic, M and Boustany, A (2014). Into the Deep Blue Sea: Commons Theory and International Governance of Atlantic Bluefin Tuna. International Journal of the Commons 8(2): 277–303. http://doi.org/10.18352/ijc.410. Evans, L. S, Ban, N. C, Schoon, M and Nenadovic, M (2014). Keeping the ‘Great’ in the Great Barrier Reef: Large-Scale Governance of the Great Barrier Reef Marine Park. International Journal of the Commons 8(2): 396–427. http://doi.org/10.18352/ijc.405. Fisheries Act. New Zealand Government, Available at: http://www.Knowledge-Basket.Co.Nz/Databases/Legislationnz/Acts/Search-Acts/View/?D1=Public/Text/1996/an/088.Html. Edited by New Zealand Government. Fleischman, F. D, Ban, N. C, Evans, L. S, Epstein, G, Garcia-Lopez, G and Villamayor-Tomas, S (2014). Governing Large-Scale Social-Ecological Systems: Lessons from Five Cases. International Journal of the Commons 8(2): 428–456. http://doi.org/10.18352/ijc.416. Glaser, B. G and Strauss, A. L (1999). The Discovery of Grounded Theory: Strategies for Qualitative Research. New Brunswick, NJ: Transaction Publishers. Hamilton, S and Baker, G. B (2016). Current Bycatch Levels in Auckland Islands Trawl Fisheries Unlikely to Be Driving New Zealand Sea Lion (Phocarctos Hookeri) Population Decline. Aquatic Conservation: Marine and Freshwater Ecosystems 26(1): 121–133. http://doi.org/10.1002/aqc.2524. Harte, M and Barton, J (2007). Reforming Management of Commercial Fisheries in a Small Island Territory. Marine Policy 31: 371–378. 10.1016/j.marpol.2006.11.005. Hatfield, E and DesClers, S (1998). Fisheries Management and Research for Loligo Gahi in the Falkland Islands. California Cooperative Oceanic Fisheries Investigations 39: 81–91. Hoving, H.-J., Gilly, W. F., Markaida, U., Benoit-Bird, K. J., Brown, Z. W., Daniel, P., Field, J. C., Parassenti, L., Liu, B. and Campos, B. (2013). Extreme Plasticity in Life-History Strategy Allows a Migratory Predator (Jumbo Squid) to Cope with a Changing Climate. Global Change Biology 19(7): 2089–2103. http://doi.org/10.1111/gcb.12198. Jereb, P, Roper, C. F. E. and Vecchione, M. (2010). Jereb, P. and Roper, C.F.E. eds. Introduction. Cephalopods of the world. An annotated and illustrated catalogue of species known to date. Volume 2. Myopsid and Oegopsid Squids. FAO Species Catalogue for Fishery Purposes. 4(2): 1–11. Rome: FAO. Mattlin, R. H and Colman, J. A (1988). Arrow Squid. New Zealand Fisheries Assessment Research Document 88/34. New Zealand Ministry of Agriculture and Fisheries, Fisheries Research Centre 17: 1–16. McGregor, V and Large, K (2016). Stock Assessment of Arrow Squid (SQU 1T and 6T). In. New Zealand Fisheries Assessment Report 2016/28. 102: Ministry for Primary Industries. New Zealand Government. Ministry of Primary Industries. Aquatic Environment and Biodiversity Annual Review 2015. 682New Zealand Government. Nelson, D. R, Adger, W. N and Brown, K (2007). Adaptation to Environmental Change: Contributions of a Resilience Framework. Annual Review of Environment and Resources 32: 395–419. http://doi.org/10.1146/annurev.energy.32.051807.090348. O’Dor, R. K (1998). Rodhouse, P, Dawe, E. G and K, R eds. Squid Life History Strategies. Chap. 11. Squid Recruitment Dynamics: The Genus Illex as a Model, the Commercial Illex Species and Influence on Variability. O’Dor. : 233–254. FAO: Fao Fish Tech Paper. http://hdl.handle.net/10222/49742. Ostrom, E (1990). Governing the Commons: The Evolution of Institutions for Collective Action. Cambridge, UK: Cambridge University Press. Ostrom, E (2007). A Diagnostic Approach for Going Beyond Panaceas. Proceedings of the National Academy of Sciences 104(39): 15181–15187. http://doi.org/10.1073/pnas.0702288104. Ostrom, E (2009). A General Framework for Analyzing Sustainability of Social-Ecological Systems. Science 325(5939): 419–422. http://doi.org/10.1126/science.1172133. Quinn, C. H, Huby, M, Kiwasila, H and Lovett, J. C (2007). Design Principles and Common Pool Resource Management: An Institutional Approach to Evaluating Community Management in Semi-Arid Tanzania. Journal of Environmental Management 84(1): 100–113. http://doi.org/10.1016/j.jenvman.2006.05.008. Rivero, A. L and Hakizimana, E (2016). Ostrom’s SES Framework: A Meta-Analysis of Community Forests in Mexico, Paper presented at the First International Symposium on Qualitative Research, Portugal. Rodhouse, P. G, Pierce, G. J, Nichols, O. C, Sauer, W. H, Arkhipkin, A. I, Laptikhovsky, V. V, Lipinski, M. R, Ramos, J. E, Gras, M, Kidokoro, H, Sadayasu, K, Pereira, J., Lefkaditou, E., Pita, C., Gasalla, M., Haimovici, M., Sakai, M. and Downey, N. (2014). Environmental Effects on Cephalopod Population Dynamics: Implications for Management of Fisheries. Advances in Marine Biology 67: 99–233. http://doi.org/10.1016/B978-0-12-800287-2.00002-0. Roper, C. F. E, Sweeney, M. J and Nauen, C. E (1984). FAO Species Catalogue. Cephalopods of the World. An Annotated and Illustrated Catalogue of Species of Interest to Fisheries. Rome: Food and Agriculture Organization of the United Nations. SESMAD. Social-Ecological Systems Meta-Analysis Database: Background and Research Methods, https://sesmad.dartmouth.edu. Sonu, S. C (1993). Japan’s Squid Market. 73Long Beach, California: NOAA Technical Memorandum MFS. Thompson, F. N, Berkenbusch, K and Abraham, E. R (2016). Incidental Capture of Marine Mammals in New Zealand Trawl Fisheries, 1995–96 to 2011–12. New Zealand Aquatic Environment and Biodiversity Report No. 105. 82Wellington: Ministry for Primary Industries. New Zealand Government. Trochim, W. M (1989). Outcome Pattern Matching and Program Theory. Evaluation and Program Planning 12(4): 355–366. http://doi.org/10.1016/0149-7189(89)90052-9. Villamayor-Tomas, S, Avagyan, M, Firlus, M, Helbing, G and Kabakova, M (2016). Hydropower vs. Fisheries Conservation: A Test of Institutional Design Principles for Common-Pool Resource Management in the Lower Mekong Basin Social-Ecological System. Ecology and Society 21(1): 3. http://dx.doi.org/10.5751/ES-08105-210103. Vojkovich, M (1998). The California Fishery for Market Squid (Loligo Opalescens). California Cooperative Oceanic Fisheries Investigations 39: 55–60. Winter, A (2016). Falkland Calamari Stock Assessment, First Season 2016. 27Falkland Islands Fisheries Department. Wittayapak, C and Dearden, P (1999). Decision-Making Arrangements in Community-Based Watershed Management in Northern Thailand. Society and Natural Resources 12(7): 673–691. http://dx.doi.org/10.1080/089419299279380. Yin, R. K (2013). Case Study Research: Design and Methods. 5th California: Sage Publications. The Falkland Islands fishery system is unique in that 60–80% of the annual catch is made up of two squid fisheries, Illex argentinus and Loligo gahi (Arkhipkinet al. 2013). This study focuses on L. gahi (also named Doryteuthis gahi), commonly known as Patagonian squid, since it is more similar biologically to California market squid. As a British Overseas Territory, the Falkland Islands are a British dependency with its own currency and government. The Falkland Island Fisheries Department manages the fisheries within the waters of the Falkland Islands Conservation Zones, and management strategies include limited entry through a license system, limited effort through a quota system, temporal restrictions (2 seasons), spatial restrictions (fishing limited to a certain area, and nursery habitat areas protected), and technological requirements (e.g. anti-seabird interaction devices required on all vessels). The Falkland Islands Conservation Zone (FICZ) was established on October 26, 1986, with the first official fishing season and the issuance of licenses beginning February 1, 1987 (Argentina and the United Kingdom 1990; Barton 2002). Before the FICZ, the fishery was unregulated and targeted by primarily Spanish, Polish, and Soviet trawlers, which began fishing the area in 1982 (Csirke 1987). An Individual Transferable Quota (ITQ) system was created in 2005 through the Fisheries (Conservation and Management) Ordinance. The ITQ system is structured as total allowable effort (TAE), where annual allocation is based on the effort cap set for the season, the number of shares held, and a vessel’s catchability coefficient. The fishery closes when the season ends (the first season runs from February to May, and the second from August to October) or when in-season modeling (assessed by the DeLury depletion method) indicates nearing a minimum 10,000 tonnes spawning stock. L. gahi is found off the coasts of Chile and Argentina, though is most abundant around the Falkland Islands (Arkhipkin et al. 2013). A small squid with a maximum mantle length between 13 and 17 centimeters, L. gahi is a neritic squid with a one-year life cycle found most frequently between the surface and 350 meters depth (Roper et al. 1984; Arkhipkin et al. 2013). L. gahi is caught by trawlers within a specific 9700 square nautical mile zone, termed the “Loligo Box” (Hatfield and DesClers 1998). Roughly 16 factory trawlers are licensed to fish L. gahi, ranging in size from 950 to 2849 gross registered tonnage. L. gahi quota is distributed among seven Falkland Island companies, which have formed Joint Venture arrangements with trawling vessels, most of which are run by Spanish masters and crew from various nations including Peru, Chile, and Indonesia. Most trawlers targeting L. gahi also participate in other fisheries including rock cod, hoki, hake, and red cod. All companies collaborate within the Falkland Islands Fishing Companies Association (FIFCA), which represents fishery industry interests (Arkhipkin et al. 2013). While catches fluctuate, the fishery lands an average of 51,000 tonnes (Arkhipkin et al. 2013). L. gahi is a major contributor to the government’s GDP (fishing on a whole contributes about a third). Fishing rights were a major factor to national claim in the early 1980s and remain central to the identity and life of the islands. The L. gahi market consists predominantly of European (primarily Spanish), South African, and Indian markets (Observatory of Economic Complexity 2015a). While a variety of squid are found in New Zealand waters, the most significant squid fishery is the arrow squid fishery. The New Zealand arrow squid fishery is made up of two similar species that are managed as one: Nototodarus gouldi (Gould’s Flying Squid) and Nototodarus sloanii (Wellington Flying Squid). The New Zealand Ministry of Primary Industries (MPI), specifically the MPI Deepwater Fisheries management team, manages the fishery. Arrow squid management includes a total allowable commercial catch (TACC) limit, quota allocated according to the TACC, commercial licenses, spatial restrictions (based on fishery management areas and protected areas), a fisheries-related mortality limit (in relation to sea lions), and technology requirements for large trawlers (e.g. seabird scaring devices). The fishery began in the 1960s with Japanese jigging vessels (McKinnon 2006). Substantial regulations emerged with the implementation of the Quota Management System (QMS) in 1986; squid were included in the system in 1987. The QMS awards allocations as a percentage of that year’s TACC, proportional to amount of quota owned. The squid fishery is divided into four separately managed fisheries, distinguished by fishing management areas (FMA): SQUlJ and SQU1T are the jig (J) and trawl (T) fisheries found within most of the mainland exclusive economic zone (EEZ), SQU6T is the subantarctic trawl fishery near the Auckland Islands, and SQU10T is the Kermadec Islands trawl fishery, although this area has been inactive since its inception. A separate TACC is allocated to each FMA. The Southern Islands area, SQU6T, is the focus of management and monitoring. The total squid TACC has not changed since the 1996–1997 season and is currently set at 127,322 tonnes (Ministry of Primary Industries 2016a). Arrow squid is one component of the deepwater fleet’s portfolio and is grouped with a number of other species (e.g. hoki, hake, warehou, jack mackerel, orange roughy) for both broader management and industry purposes. The largest squid included in this study, both species have a maximum mantle length of 42 centimeters (Smith et al. 1987). Both Notototodarus species in New Zealand have a one-year life span and are thought to migrate to shallower water to spawn, though spawning areas are still unknown, a major gap impeding management choices. Both species are found over the continental shelf up to 500 meters depth, and are most frequently found in waters shallower than 300 meters. While the two species distributions overlap, N. gouldi is found primarily in Northern New Zealand waters, and N. sloanii is mostly found most often in Southern waters, particularly off the Snares and Auckland Islands (Smith et al. 1987). The fishery is dominated by 12–15 trawling vessels, with a mean length of 43.6 m and a mean tonnage of 793 tonnes, though a number (roughly 60–70) of smaller vessels do participate as well (Clement et al. 2008). There is a very small recreational fishery, a small commercial jigging fishery, and no indigenous fishery, though New Zealand tribes are heavily involved with the New Zealand companies that involve squid. All vessels are flagged as New Zealand, and all quota is owned by New Zealanders, but some vessels are Joint Ventures which charter vessels from other countries, most notably from South Korea and Ukraine. New Zealand arrow squid is primarily exported, with major markets including China, Greece, Korea, United States, Taiwan, Spain, Italy, and Croatia (Observatory of Economic Complexity 2015b). Before the current management system landings peaked at 214,072 tonnes in 1983–84, and in the time since the system was implemented, landings have varied with an average of 53,000 tonnes, well below the TACC (McKinnon 2006; Ministry of Primary Industries 2016a). According to study participants, the TACC has not been reached because of the sea lion fisheries-related mortality limit. The Deepwater Group (DWG), an industry non-profit, ensures squid vessels adhere to a number of non-legally binding mandates, many of which are stricter than MPI requirements. The most important aspect of the New Zealand arrow squid fishery is its relation to the endangered and endemic New Zealand sea lion (rāpoka) Phocarctos hookeri, the rarest sea lion in the world. While MPI does not require Sea Lion Excluder Devices (SLEDs), DWG ensures all trawlers use SLEDs and organizes the monitoring and tracking of such devices and their effectiveness. MPI distributes discounts on the pre-determined sea lion strike rate to SLED users. Many New Zealand conservation organizations aim to protect the New Zealand sea lion, of which the squid fishery is responsible for the most sea lion-fishery related deaths. The California market squid (Loligo opalescens) fishery began in the 1860s in Monterey Bay as a primarily Chinese dry-squid fishery. Today market squid is one of the highest valued fisheries in California. California market squid was an open-access fishery before 1998, when Senate Bill (SB) 364 became effective, establishing a moratorium on new squid vessels. The California Department of Fish and Wildlife (CDFW) Market Squid Fishery Management Plan (MSFMP) is the primary mechanism for squid management. Development of the plan took into consideration the Pacific Fishery Management Council’s Coastal Pelagic Species Fisheries Management Plan, which includes market squid as a monitored species. The Council considers market squid an actively managed species only in the circumstance where the egg escapement is measured to be below a 30% threshold for two consecutive years (Pacific Fishery Management Council 2016). The state is the primary management body, since market squid is found predominately in state waters, but the Council also monitors squid because the natural population extends beyond state boundaries and is targeted both south and north of California’s waters. California market squid is managed according to a seasonal catch limitation [118,000 short tons (107,048 tonnes)], temporal restrictions (weekend closures), technological requirements (light wattage), effort limitation (capacity goal and permits), and spatial restrictions (e.g. Gulf of Farallones Sanctuary, state marine protected areas). L. opalescens (more recently referred to as Doryteuthis opalescens) is a single population found from Baja California, Mexico (23° N latitude) to southeastern Alaska (55° N latitude). A small squid with an average mantle length of 152 mm, L. opalescens continually spawns throughout the year, with a new cohort added almost monthly. Market squid live about 6–9 months, dying after they spawn nearshore. While a small recreational bait fishery and a small commercial brail fishery exist, the overall fishery is dominated by American roundhaul vessels that work alongside smaller light boats. Roundhaul vessels are an average of 18.9 m long with an average capacity of 81 gross tonnage, and use nets averaging 381 m long and 48 m deep (State of California Resources Agency 2005). Lightboats are an average of 11.8 m long with a gross tonnage of 19 tons and their lights average 22,500 watts (below the 30,000 watts legal maximum) (Pomeroy and FitzSimmons 2001). Recently, CDFW issued 75 vessel permits, 34 light boat permits, and 44 brail (netted scoop) permits, though the fishery is dominated by mostly 43 round haul vessels (Pacific Fishery Management Council 2014). Most vessels also target other coastal pelagic species including sardine, anchovy, and pacific mackerel. The squid fishing season runs from April 1st to March 31st, though is most active between May and September. L. opalescens is exported worldwide (it has been sent to 106 countries since the 1970s) but is primarily exported to China and, to a lesser extent, sent to Japan, Spain, the Philippines, and Vietnam (National Marine Fisheries Service 2016). Since the management system was initiated, commercial landings have averaged 90,000 short tons (81,600 tonnes), and have exceeded the catch limit twice (2010 and 2011 seasons). Since then, a new daily tracking program has decreased the risk of exceeding the catch limit in future seasons. The California Wetfish Producers Association communicates industry interests to management and the public. The California market squid fishery is sensitive to environmental conditions, particularly El Niño Southern Oscillation (ENSO) events; it becomes virtually inaccessible during El Niño events, while La Niña events often relate to population surges. Social-ecological outcome variable characteristics from SESMAD information from SESMAD, 2014. Characteristics of SESMAD variables contributing to design principles information from SESMAD, 2014. In addition to the design principles, I identified four noteworthy variables that contribute to a case’s social and ecological outcomes, particularly in terms of the governance system meeting its goal. Summarized coding results for each of these variables are displayed in Table A.3.1. These variables’ coding structures are in Table A.3.2. Coding results summary of key variables contributing to study outcomes. Colors indicate a variable’s association with CPR theory, green indicates the value is more likely to contribute to resource sustainability, yellow to be somewhat met, and red (which is absent) would indicate it is least likely to contribute to resource sustainability. (3) Indicates the variable is present, (2) indicates it is somewhat present, and (1) would indicate the variable is absent. Characteristics of key SESMAD variables contributing to study outcomes information from SESMAD, 2014. While the design principles indicate evidence that supports how each governance system has led to positive social and ecological outcomes, this study is also open to the possible role of other social-ecological system variables from CPR theory that may contribute to meeting governance goals. These other contributing variables should not be viewed as theory-tested evidence, but rather explanatory factors whose relevance to CPR systems are supported through the studies used to build SESMAD. Of the other contributing variables identified, the most significant is economic dependence. CPR theory denotes that greater economic dependence oftentimes motivates and encourages sustainable practices and collective action (Agrawal 2002; Ostrom 2007). This is particularly true in the Falkland Islands. The Falkland Islands community is aware of squid fishing activity because of squid’s large contribution to the government’s GDP. Defense aside, the Falkland Islands are able to be completely self sufficient from the United Kingdom because of the two squid fisheries. It is in the interest of the nation to keep the squid fishery stable, which greatly contributes to meeting management goals. In New Zealand and California, squid play a central economic role. In both cases, squid contribute a significant amount of the economic profit from the fishing industry, and provide financial support that enables the fishery at large to target a wide portfolio. In this view, squid can be considered a keystone species in the economic portfolio of the fisheries. As it partially depends on squid, New Zealand fishery management is able to keep the squid fishery active as it proves to be important, but can focus their efforts on satisfying their goals of sea lion conservation and a healthy ecosystem. This tradeoff between maximizing economic potential and satisfying management goals can be avoided because of the economic dependence of these fisheries. The variable ‘leakage of benefits’ of squid governance also plays a significant role and is present in all three cases. Management actions have decreased bycatch rates (primarily of seabirds and sea lions) in the three squid fisheries, thus benefitting greater ecosystem conservation. In the Falkland Islands, license fees often pay for 50% national budget (providing for roads, schools, etc. ), and fishing company taxations contribute to further benefit national infrastructure (Harte and Barton 2007). In the Falkland Islands and New Zealand, reflagging of vessels to Falkland Islands/New Zealand led to improvements in working conditions on squid vessels, often benefiting foreign crewmembers. While such benefits are not necessarily directly related to management goals, they encourage continued support of management efforts. Science-based policy, the third identified variable, is strongly evident in each of the three cases, both in terms of policy formation and in consistent system reevaluation. In New Zealand, the robustness of science has become an issue concerning efficacy of SLEDs. However, this debate is handled through the court system. Each management system encourages the presentation of new material and practices to reflect the best available science. As these are relatively new (60 years old) and rapidly expanding fisheries, it is constructive for these squid fisheries to have policies to allow new information to be incorporated, such as the relationship with ENSO events, distribution information, and the influences of climate change. In the Falkland Islands, I. argentines has occasionally expanded into the L. gahi range due to changing water temperatures and predated upon L. gahi, decreasing its stock size. Science-based, adaptive policies allow management to account for new drivers of change, such as the influx of I. argentines, in order to ensure the population remains at a sustainable level. Scientific efforts have significantly contributed to designing more effective SLEDs and to understanding the multiple drivers behind sea lion population declines (Roe 2009; Hamilton and Baker 2016). Surveys of spawning areas allow critical habitats to be protected in California and the Falkland Islands (Arkhipkin and Middleton 2002; Zeidberg et al. 2012). Egg escapement models have been successful in maintaining healthy market squid populations (Dorval et al. 2013). This study finds that the careful emphasis on science-based policy has contributed to management goals, as expected by theory (Sullivan et al. 2006). Science-based policies contribute to the last identified additional contributing variable, flexible rights. Each governance system allows for changes in approaches and practices according to new knowledge. In-season daily monitoring allows the Falkland Islands Government to employ in-season changes according to conditions (e.g. spawning times) or sudden disturbances (e.g. unusual Illex predation). In New Zealand, industry reports are sent weekly to the Minister and other interested parties regarding sea lion interactions. Managers constantly converse with scientists and review observation data so that changes may be made according to new information. New information such as higher squid abundance can lead to an increase in the fishing mortality rate limit allocated for that year, allowing for more fishing days in the SQU6T region. New information on SLED efficacy can increase or decrease the allocated discount or can even close the fishery. In California, a daily tracking system helps inform managers on how close the fisheries are to catch limits, and a constant evaluation process indicates when the fishery should be closed in the case of low availability, thus allocating the remnants of the population to support squid predators. The acknowledgement of scientific and other stakeholder input can lead to increased or decreased fishing effort, as dictated by the pursuance of management meeting its goals. Agrawal, A (2002). Ostrom, E, Dietz, T, Dolsak, N, Stern, P. C, Stovich, S and Weber, E. U eds. Common Resources and Institutional Sustainability. Chap. 2. The Drama of the Commons: Committee on the Human Dimensions of Global Change. : 41–86. Washington, DC: National Academy Press. Arkhipkin, A. I and J. Middleton, D. A (2002). Sexual Segregation in Ontogenetic Migrations by the Squid Loligo Gahi Around the Falkland Islands. Bulletin of Marine Science 71(1): 109–127. Barton, J (2002). Fisheries and Fisheries Management in Falkland Islands Conservation Zones. Aquatic Conservation: Marine and Freshwater Ecosystems 12: 127–135. Clement, G, Wells, R and Gallagher, C. M (2008). Townsend, R, Shotton, R and Uchida, H. eds. Industry Management with the New Zealand Quota Management System: The Orange Roughy Management Company. Case Studies in Fisheries Self-Governance Fao Fisheries Technical Paper 504. : 277–290. Rome: FAO. Csirke, J (1987). The Patagonian Fishery Resources and the Offshore Fisheries in the South-West Atlantic. FAO Fisheries Technical Paper 286. : 75.Rome: Food and Agriculture Organization of the United Nations. McKinnon, J. F. (2006). Aspects of the Population Biology of the Southern Arrow Squid, Nototodarus Sloanii, in Southern New Zealand. Ph.D. dissertation. University of Otago. National Marine Fisheries Service. NOAA NMFS Foreign Trade. Cumulative Data. Trade by Specific U.S. Customs District. Trade Type Exports. Product: Squid Month: January 1975 to December 2016. http://www.st.nmfs.noaa.gov/commercial-fisheries/foreign-trade/raw-data/imports-exports-annual. Observatory of Economic Complexity. Falkland Islands: Where Does the Falkland Islands Export Molluscs To?, http://atlas.media.mit.edu/en/visualize/tree_map/hs92/export/flk/show/0307/2015/. Observatory of Economic Complexity. New Zealand: Where Does New Zealand Export Molluscs To?, http://atlas.media.mit.edu/en/visualize/tree_map/hs92/export/nzl/show/0307/2015/. Pacific Fishery Management Council. Status of the Pacific Coast Coastal Pelagic Species and Fishery and Recommended Acceptable Biological Catches: Stock Assessment and Fishery Evaluation 2014. : 96.Portland, OR: PFMC. Pacific Fishery Management Council. Coastal Pelagic Species Fishery Management Plan as Amended Through Amendment 15. : 49.Portland, OR: PFMC. Pomeroy, C and FitzSimmons, M (2001). Socio-Economic Organization of the California Market Squid Fishery: Assessment for Optimal Resource Management. 21: California Sea Grant. Roe, W. D (2009). Necropsy of Marine Mammals Captured in New Zealand Fisheries in the 2007–08 Fishing Year. New Zealand Aquatic Environment and Biodiversity Report No. 34. 35Wellington: Ministry for Primary Industries. New Zealand Government. Smith, P. J, Mattlin, R. H, Roeleveld, M. A and Okutanp, T (1987). Arrow Squids of the Genus Nototodarus in New Zealand Waters: Systematics, Biology, and Fisheries. New Zealand Journal of Marine and Freshwater Research 21(1): 315–326. http://dx.doi.org/10.1080/00288330.1987.9516227. Sullivan, P. J, Acheson, J, Angermeier, P. L, Faast, T, Flemma, J, Jones, C. M, Knudsen, E. E, Minello, T. J, Secor, D. H, Wunderlich, R and Zanetell, B. A (2006). Defining and Implementing Best Available Science for Fisheries and Environmental Science, Policy, and Management. Fisheries 31(9): 460–465. Zeidberg, L. D, Butler, J. L, Ramon, D, Cossio, A, Stierhoff, K. L and Henry, A (2012). Estimation of Spawning Habitats of Market Squid (Doryteuthis Opalescens) from Field Surveys of Eggs Off Central and Southern California. Marine Ecology 33(3): 326–336. http://doi.org/10.1111/j.1439-0485.2011.00498.x.